As recent events have shown us, asthma attacks can strike fast and to a widespread range of individuals. Even those who have never been affected before could develop asthma over their lives and experience a sudden onset for the very first time during an extreme weather condition. Melbourne is known as a global hotspot for the ‘thunderstorm asthma’ phenomenon, so we tend to experience more cases of it than anywhere else in the world. 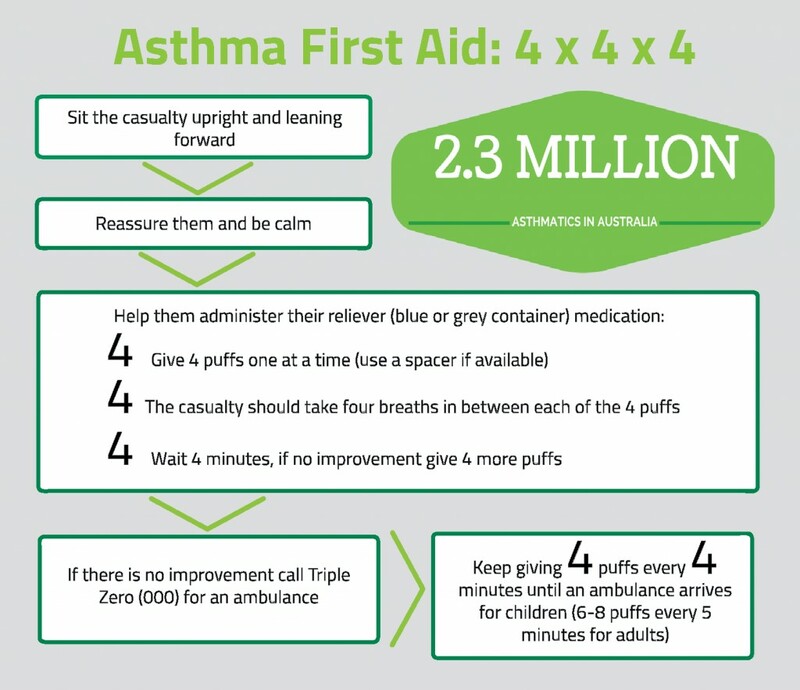 Knowing what to do for asthma first aid will help if this happens to you or anyone around you. How do you know if you might experience thunderstorm asthma? A study found that in 95% of those affected, they’d had a history of hay fever and allergies. If this is you, a workmate or a family member, you should be particularly aware of what to do for asthma first aid. A wheeze may be audible, however, in a severe attack there may be so little air movement that a wheeze may not be heard. If the casualty is unconscious, follow DRSABCD and call Triple Zero (000) for an ambulance. 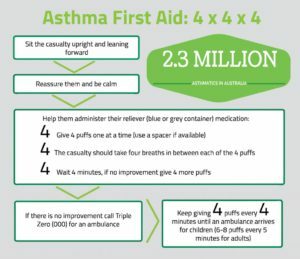 For conscious casualties, following the 4 x 4 x 4 method is the best first aid treatment for an asthma attack. With millions of Australians suffering from asthma and many more millions from hay fever that could trigger asthma, we should all be prepared with the knowledge and equipment to manage an asthma attack. As a precaution, everyone can keep a reliever inhaler (e.g. Ventolin) in their personal First Aid kit to use should the need arise. Ventolin is available without a prescription to anyone in Victoria and if taken by non-asthmatics will not be harmful. Anyone having a SEVERE asthma attack needs urgent medical treatment.